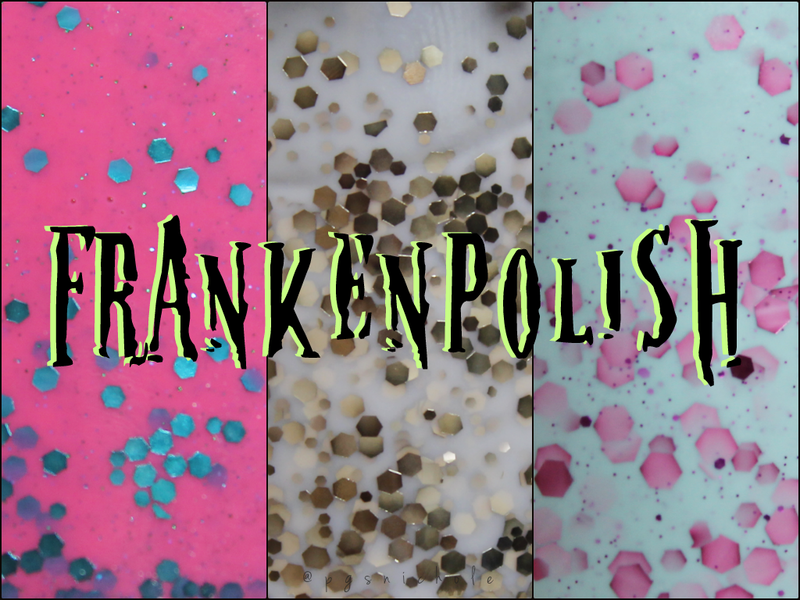 I realize that if you are reading this blog, the chances that you know what "frankenpolish" means are pretty damned high. In fact, there is a good reason you are giggling at me right now for my late arrival to this party. But I have been bitten by this bug, and really...it's bad guys. I'm hooked. For those who aren't proper lacquerheads, "frankenpolish" is basically combining polishes, pigments, or glitters together to form a completely new polish. I know quite a few people (...Amanda) who buy polishes strictly for their frankening potential. I used to think this was nuts. Now...I can definitely understand it. When I was searching for Miss Argentina inspiration, I stumbled across a blog post detailing how to make your own Miss Argentina inspired franken polish. I actually had everything (or a near-dupe) I needed to make this polish, so I jumped right in. From the first coat of my DIY polish, I was hooked. That frankening tag is about to get a work-out. I have had a fantasy of having a white polish with gold glitter or shimmer. In my dreams, its a gold pearl finish...but this is good enough. I'm sure I could have found an indie to fill this spot...but none that I found were quite perfect enough for me to pull the trigger. This isn't exactly what I wanted either, but I love it because I made it myself. Why yes, I am a Pink Floyd fan...how did you know? This one was basically born of "I like these two colors! Let's put them together again!" This one was by-far the best of my experiments. It covers in two coats and doesn't need much top coat to smooth things out. I give myself an A+ on this one. The polish that started it all. I actually made mine far paler than the original polish, and I think I prefer it this way, especially with the glitters I used. I can see this polish being in heavy rotation come springtime. It looks clean and fresh without being omgspringeaster colored. I am so happy that I found that blog post. It might have changed my life. Well?! What is the verdict? Did I do the frankening world justice? I think this is a great way to reuse polishes that didn't work or that you never wear. Though I definitely see myself buying cheap polishes strictly to remake my own...along with a TBK order. The future is definitely bright and filled with glitter. Aurous is fabulous! I think you may have just gotten me into trouble. I don't buy glitter much as I don't seem to use it often, but after seeing this, I could justify it. Uh oh. in my day-to-day life, I'm not huge on glitter. It has to be special for me to want to wear it...but polishes like these? I am all about 'em. Plus, now you don't have to ignore the glitters you see on the clearance racks! Well done! Frankening is indeed addictive. LOL I think some, if not many, indie makers started out frankening & when peeps liked what they were making...they took the plunge into the home business arena. I can definitely see it going that way for me...if people like my stuff! I've only created a frankenpolish once, but I was a bit disappointed because the added shimmer didn't shine through as much as I liked. But I definitely want to give it another try with some of my unloved polishes! I figured the megarocks were on their way to the curb anyway...so I might as well! Oh yes. Franken all the things forever.